We are now well into the golfing season and this week sees quite a bit of activity on the Links. On Wednesday next there is a Mixed Scramble on the Kilmore Nine very kindly sponsored by David Gough, compile your own team or sign entry sheet in the Bar, draw at 6pm. On Thursday evening for those willing to volunteer to help the greens staff, there is a couple of hours of re-divotting and a general clean up so that the course is looking it's best for the busy months ahead. Gather at 18:30 ,Chris and Gary will have sand and seed ready for distribution. On Friday evening , as part of the Clann Lir Festival in the town there is a fun 9 hole Mixed Scramble over the Hackett Back Nine. On Saturday the Ladies host Mulranny and Achill in the Gráinne Uaile and also on Saturday afternoon the Men's Pierce Purcell Team take on Claremorris. 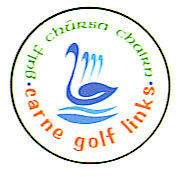 The Men's County Cup is also scheduled for Saturday at Castlebar Golf Club. 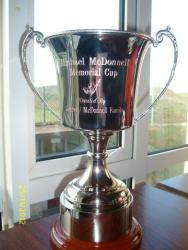 On Sunday it's the Blue Tees for the Men as they compete for the Michael McDonnell Memorial Cup, John Hanley defending.